We’d love your help. Let us know what’s wrong with this preview of The Truth About Everything by Matthew Stewart. Throughout history, well-known theories of reality, knowledge, mind, and most particularly the "professional" philosophers who rely on them for their intellectual existence, have sought to isolate universal truths and structure the history of philosophy to distinguish schools and movements that seek a comprehensive understanding of our world. But in this well-intended purs Throughout history, well-known theories of reality, knowledge, mind, and most particularly the "professional" philosophers who rely on them for their intellectual existence, have sought to isolate universal truths and structure the history of philosophy to distinguish schools and movements that seek a comprehensive understanding of our world. But in this well-intended pursuit of truth, have we lost sight of what philosophy is? Matthew Stewart believes we have. To ask other readers questions about The Truth About Everything, please sign up. This book takes the reader on a tour of the history of philosophy, and the author attempts to show the problem with practically all philosophies through history. The generalized problem is that philosophy as practice in the past and present attempts to provide a theory of everything—the ultimate why question—or, as he calls it the “Holy Grail.” Philosophies differ in what exactly is the why, but all have historically sought it, as Matthew Stewart sees it. 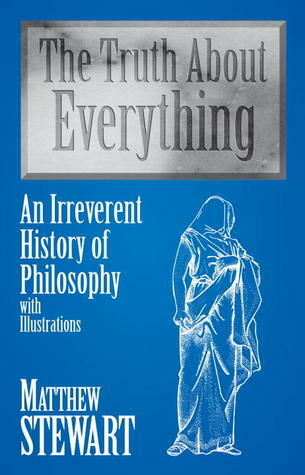 He works his way beginning with the pre- This book takes the reader on a tour of the history of philosophy, and the author attempts to show the problem with practically all philosophies through history. The generalized problem is that philosophy as practice in the past and present attempts to provide a theory of everything—the ultimate why question—or, as he calls it the “Holy Grail.” Philosophies differ in what exactly is the why, but all have historically sought it, as Matthew Stewart sees it. He works his way beginning with the pre-Socratic philosophers through the big three (Socrates, Plato, and Aristotle) into the Hellenistic period. From there he covers Neoplatonism, early, mid, and late middle ages, Renaissance, early modern, modern, and recent philosophies, culminating in philosophy of mind. At the end of the book he tells what philosophy should be doing and practicing, including the hiring of non-Ph.D.s for regular college teachers. Here are some specific comments based on pieces of text and some general remarks formulated at certain points as I was reading. Kindle locations are given in brackets  with @ indicating a general remark. In commenting on Socrates’ idea that “virtue is knowledge,” and “that being good will also make you happy.” Stewart says, “presumably, those bank robbers [mentioned earlier] are miserable.” If they are angry bank robbers, this may well be the case. I feel that it is either impossible or very hard for angry and mean people to be happy.^ He states shortly after : “Likewise there is much evidence to suggest bad people can be happy . . .” First, I ask what evidence? He provides none. However, this does not affect my feeling because I am claiming it for angry and mean people. “Nothing can kill a philosophical discussion as quickly as a fact.” That is why philosophy must be informed by science. Stewart says that Aristotle thinks: “Wisdom is true knowledge.” I would say instead that wisdom is the ability to use knowledge in making good life decisions. “From the smorgasbord of three millennia of philosophy, writers today simply mix and match their own strange dishes.” I could be accused of this. But, I hope my dishes are tasty. Speaking in relation to the time of the cult of Mithras: “The philosophies and religions all promised consolation. They offered happiness to those who were unhappy.” This has probably never been true, and when we look at Schopenhauer and Nietzsche it is definitely not true. “Whether or not this kind [never mind what kind] of quasi-truth therapy works in individual cases, it is by no means a sure-fire cure. After all, it is just talk.” (author’s italics) Does he mean they need anti-philosophy drug like an anti-depressant, when therapy is not enough. Therapy is just talk after all. “The first truth [of Buddhism] is that life is quite unpleasant. It’s one bad thing after another . . .” Maybe some people’s lives are like this, but I think most people find a certain amount of good things in life in addition to the bad that unavoidably occurs. “Second, the cause of our suffering in life is our own desires.” Oh yeah, my desires really gave me a stomach mass. “Third, the cessation of suffering is possible if we give up on our desires and our illusory notion of self.” This is idiotic and impossible despite what the gurus claim. And, disassociation is considered a mental illness. “The result [of all of this], if you’re lucky, is a dissolution of the self and an encounter with Nirvana, or the Nothing, which is what is ultimate reality.” So you give up and live with a mental illness. “Put another way existence is part of the definition of God.” Only as much as anything else. Why should god be so privileged? That is why “is” is not considered in logic a predicate that is attached to a subject. “Our eyes, after all, merely offer us a pallid and probably false representation of what things really look like.” Things do not look like anything at all without eyes and a nervous system. “How can the mind want anything, if it has no passions?” It cannot—feelings and thoughts are interconnected. I agree with Stewart. If Kant’s treat others as ends and not as means really means just to respect others, then it is an admirable principle to aim for. [@3888] At points in this chapter on Kant it seems like gobbledygook explaining gobbledygook. The same could be said in other chapters on idealists and existentialists. In a section where Stewart takes on the persona of Hegel he writes: “Hegel (or was it I?) said, the introduction, the statement of the aim of a philosophical work, is nothing; it is the doing that counts.” Am I in agreement with Hegel here? Well, I see philosophy as an exploration,* but an introduction serves as a kind of road map; it furnishes the things to be explored, so I guess I am not really in agreement with Hegel (or is it Stewart) after all. “The Principle of Intellectual Indigestion. Consumption of too many philosophies interferes with clear thinking, and may induce apocalyptic nightmare and/or delusions of grandeur.” His humor is visible throughout the book, but this is one of his best. Stewart writing about the logical positivists states: “Philosophy can still be a universal science if it limits itself to questions about what can and cannot be expressed sensibly. But the bounds of sense are the bounds of what can be expressed, and the bounds of what can be expressed are the bounds of thought.” So, philosophy turns into a kind of proofreading of sentences and the propositions they state. Continuing with the analytic philosophers, he further states: “If something can be thought, it can be expressed. If it cannot be expressed, it cannot be thought.” I am not so sure of this position because I tend to think that we do not think in language anyway. Our thoughts are translated into language is my notion. So, neither part of this quotes appears to be correct if I am right in this notion. “Hegel was reduced to an empty cover.” An excellent dig at Hegel. Quoting Ludwig Wittgenstein in his , “6.43 The mystical lies in accepting what is, that it is. It is accepting the form of life.” Sounds more like stoicism to me. [6070-91] In connection with his “THE TENURE SUTRA,” [His dig at the tenure track] Stewart has a webpage @ http://mwstewart.com/about/ where he claims: “I graduated from Princeton University in 1985 with a concentration in political philosophy. I was awarded the Sachs Scholarship from Princeton for study at Oxford University, where I earned a D.Phil. in philosophy in 1988. In the course of my doctoral studies, I discovered what I took to be irrefutable philosophical objections to pursuing a career in academic philosophy.” This along with his suggestion to hire university teachers without Ph.D.s , where he writes: “The Ph.D. in its present form is a membership purchased by economic indentureship in an exclusive guild whose function is to restrict the natural activity of the marketplace,” suggests he did not feel well about his university education experience. I still wonder if he just did not find an academic position upon graduating. I do not know; it is just a suspicion (probably false). Anyway the economic situation is probably similar in all fields of study once you reach graduate studies. This last point is maybe why he decided to write such a book, that attacks practically every form of philosophy. He only seems partially pleased at the work of Hume, Nietzsche, and Wittgenstein. But, it also appears that he had an immense amount of fun writing it. I would also agree for the most part, but especially so for philosophical positions that deem to know the answer for certain, instead of being an exploration. * I believe that anything in philosophy that asserts itself as an absolute truth is no longer philosophy, but something more akin to theology, which seeks to prove dogma. And then over time some of philosophy has been turned over to science. Science, while always open to revision, is the closest we can come to know what is what in the universe. Overall, I enjoyed the book a lot. I only wish he spent less time on idealism and existentialism, but again there is a lot to critique in these parts of philosophy. I also found the book to be very amusing in places. Stewart certainly has a wry sense of humor. My recommendation for this book is for those that have any interest in philosophy. But, especially those who desire to see philosophy criticized in all its twists and turns. There is a lot to learn about philosophy in this book even if you do not agree with Stewart’s conclusions. It reminds me of Walter Kaufmann’s Critique of Religion and Philosophy with the exception that Kaufmann’s book lacks the sense of playfulness that this book has. It's a pity this book hasn't reached a wider audience (judging from the few ratings and lack of any detailed review here, so far). It occupies a little niche of its own without being merely a novelty. The book is great on many levels. Don't let the "irreverent" or "illustrations" parts in the title give the wrong idea. As a serious, straightforward history of philosophy, it's the most interesting and informative I've come across (compared to books of similar length of course, not multi-volume phi It's a pity this book hasn't reached a wider audience (judging from the few ratings and lack of any detailed review here, so far). It occupies a little niche of its own without being merely a novelty. The book is great on many levels. Don't let the "irreverent" or "illustrations" parts in the title give the wrong idea. As a serious, straightforward history of philosophy, it's the most interesting and informative I've come across (compared to books of similar length of course, not multi-volume philosophy encyclopedias/histories). The author may have a cynical, negative bias on the value of philosophy (despite his philosophy background, Oxford degree, etc) but this becomes an asset here. A single volume on history over millennia inevitably has to have the ideas written in a short and down to earth manner, perhaps as unromantically or unlovingly as possible. The book covers most schools and philosophers that a layman may have heard of (and perhaps many more, depending on the person) and most sections are surprisingly deep. Despite the inevitable brevity, I often reread parts to follow the concepts/arguments, there are few words wasted. On another level, the humorous parts aren't shallow attempts at crudity or light-heartedness, they almost always connect to the philosophy. I write the review a few years after I read the book, and what makes me remember more the serious parts is the creative analogies, the parodies, etc. The fun part was educational. As for the author's arguments throughout the book (and especially in the end), he tries to show the wordiness, over-complication, pretension and dogma (as well as other negatives) that he finds making constant appearances in the history of philosophy. But he's self-aware to understand that his ideas could be classified as philosophy also, that his opinion isn't that unique (there's a rich history of anti-philosophy philosophers), and more importantly, that once philosophy bashing is taken too far it becomes fanaticism/dogma, what he criticizes throughout. And for another exception to the rule (the dogma), the section on David Hume is surprisingly so quiet and respectful that considering the general negative tone, it becomes equivalent to a moving, glorious tribute. I write this to try to show that even if one disagrees with the author's premise and arguments, the book can still be extremely enjoyable and engaging, you can take what you want from it, whether you take philosophy seriously or not. Very funny and entertaiment way to see philosophy. I first happened upon La Rochefoucauld in Stewart's book, and I am grateful.